All Things Slobbery : Long Time No See! Sorry it's been so long, but between moving and being so pregnant I have not been very good at taking pictures or blogging. We did the initial move in and have been slowly (very slowly since I can hardly move) decorating and hanging pictures, ect. It's going to take a while but it will be fun collecting and crafting. The first few pictures are from when we were still staying with David's parents. We are so thankful that they had the space and were willing to let us stay while we found and closed on our house. "Let me take a picture!" I heard Bo giggling and found him giggling and kissing himself in the mirror. I've been getting Ava's room together lately (since she'll be here in 26 days or less). We found a great deal on a crib, which has the parts to be converted into a toddler bed, and mattress at a garage sale and I've been having fun crafting things to decorate the walls. Originally I was going to repaint the walls white and gray, but when I got some of Bo's old decorations out that I was going to reuse, the paint colors worked so well I'm keeping it the same. It's hard to tell in the pictures, but it's a very pale pink on top and brown on bottom. My first craft for her room was repurposing an old mirror that I found in the leftover stuff from our church's garage sale. I took the mirror out and spray painted it a berry pink. I then found a wooden letter A and mod podged some scrapbook paper on it. Here are the before and afters. 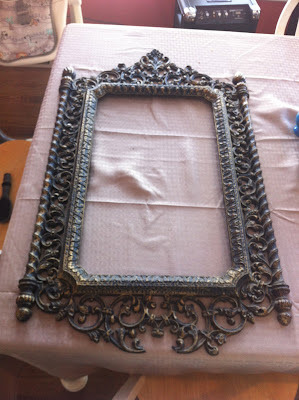 Here is the frame before, minus the mirror. All painted and hung above the crib. While mod podging the letter A, I also mod podged some small letter o's with scrapbook paper to create some closet organizers. They hang on the clothing bar and separate the clothes into sizes. I wish I would have used larger stickers for the size numbers, but oh well. I made them up to 18 months. I have a frame that I was going to turn into a bow holder but I would need to spray paint it, cover the back, put ribbon on it, ect. I'm running out of time so I'm keeping the frame for a jewelry holder for me later. I found some black metal letters at Hobby Lobby and just attached some ribbon onto them to clip all of Ava's bows and flowers. I also found some cast iron bird hangers at Hobby Lobby for 50% off to hang headbands. I love the way it turned out and I still have more space for more bows! Just with a few clips and headbands. Full - still have some space left though! I need some bows! Close up of the letters and ribbon. Close up of the bird hangers - love them! Here are some other pics of her room decorations. It's coming together! Now we just need a dresser! Sitting in the frog bouncy seat wearing sister's headband. I was able to reuse the tree wall decal from Bo's room. The dresser will go here. Ava's closet - notice how Bo "helped" in the lower right corner. More decorations I was able to reuse. Bo's cowboy room is coming along but that'll be for another post! I love the decor! That is so fun. I wish I had the creativity for that stuff that you do. Naomi is sad that there are no videos of Bo today. She loves watching them. You should hear her come up to the computer and ask for "Bo dance?" it's so cute! Love the decor-the framed "A" is the cutest! I am in love with that hot pink frame! That is such a cute way to use it!